Hoping to snag the best price on a plane ticket? Try booking almost seven weeks in advance. CheapAir.com analyzed nearly 5 million trips last year and found the best prices for domestic airfare were booked, on average, 47 days ahead of the departure date. The year before, the sweet spot was 54 days. The online airfare shopping engine tracked prices from 320 days in advance up until the day before a flight and found the prime booking window was generally one to four months ahead of departure. The lowest price of a ticket changed around 70 times when it was for sale, the report found. By booking on the cheapest day, fliers saved an average of $201 on airfare, excluding the 14 days before a flight since fares are much higher then. If those two weeks are included, the difference rises to $319. Of course, there are no guarantees. Many factors can affect ticket prices, including time of year, the destination and local events. "As much as everyone wants an answer for an exact number so they don't have to worry about finding the best price, it's not that simple," said Jeff Klee, CEO of CheapAir.com. While booking the lowest price isn't an exact science, one thing is clear: procrastination doesn't pay. Buying tickets within 14 days of departure resulted in paying $111 more on average and $174 more when bought seven days in advance. However, booking too early can also mean paying more. When a ticket is first offered, it's priced about $50 above its lowest point, according to the report. As time goes on, carriers start offering periodic short-term sales to fill seats. "The odds of you paying the exact same price as the person sitting next to you is really small," Klee said. Airline consolidation has impacted prices, he added. When one carrier offers a sale, the others are likely to follow suit to remain competitive. Less players in the game means less options for consumers. "It used to be a buyer's market." 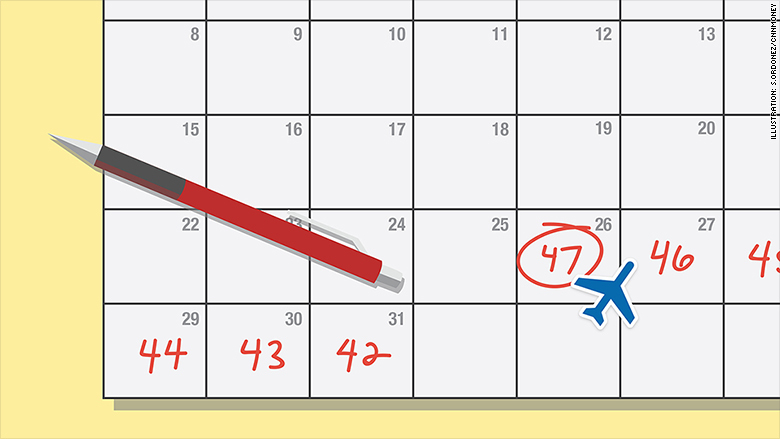 The day you fly can also bring savings. Tuesday and Wednesday are the least expensive days to fly, said Klee, while Sunday and Friday were the most expensive. He also recommended searching flights early and often and be ready to pull the trigger. "Prices change really frequently, people make the mistake of going home and talking to their family to figure out plans and come back the next day and it's gone."